Wow, Can you believe that Monday is the beginning of Febuary already, were already almost through the first month of 2010, but the thing is .. I thought it was only yesterday I was writing to tell you guys that 2010 is finally here not almost Febuary .. lol .. wow how the time is going!! So is everyone excited about the winter games??? I know I am, I think its one of the best Labrador traditions out there!! I mean people gathering from all over Labrador to compete in games, soo fun!! It’s kinda nice too knowing that everyone will be together in one community, its really great and we all know its not about winning or losing its the fun. Do you know what else is happening in the the same week? It’s somebodys birthday!!! Yup thats right Them Days is going to be 35 on March 15th, big day and were hoping that we will have the newest issue out before the winter games begin, For those of you who don’t know, Them Days and The Labrador Winter Games both share the date March 15th, the Winter Games first started March 15th 1983. So March 15th is going to be an exciting day so hopfully we will have nice weather for that week and we all have fun watching the teams compete for the Labrador Cup!!! Well guys thats all for me, I’ll be back to write another day.. have a great day and don’t forget to drop by or go online to see the great deals we have here, it is always great to sit down and relax with a Them Days book. 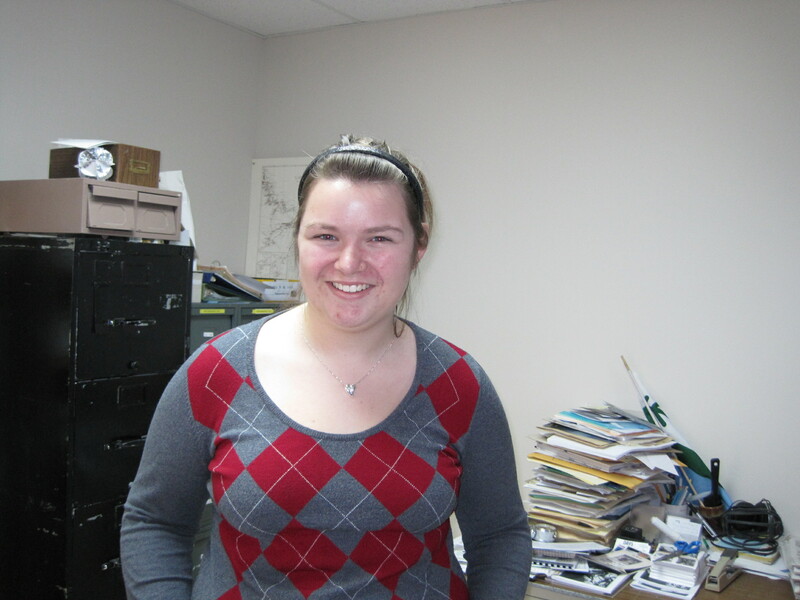 Hello everyone, this is Marleah Aitken the brand new Katimavik-er! Today is only my second day at “Them Days” and my sixth day in Labrador, I am so excited to finally be here and to have this great work placement. Cumberland, British Columbia is the place I call home but for the past three months I have been living in Chicoutimi QC. While living with a host family in Chicoutimi I was asked which of the three communities I would be living in I was most excited for and without thinking I responded “Happy Valley-Goose Bay”, after the look of shock faded from ther faces and I explaned myself i think that even they agreed that labrador was worth the excitment. My key selling point was the Labrador Winter Games, how lucky is my group, it only happens every three years and it was ment to be last year, it must be fate. I am super happy to be here and I know that I will have an amazing time. I am looking foreward to spending my days in the “Them Days” office and my time off exploring and getting to know labrador. Well, I guess its time to introduce the newest Katimiviker to you guys, she is very nice and somewhat quiet but we will get her out of that and she is very eager to learn all about what we do here at Them Days!! Ok are you ready? The newest member of “Team Them Days” is .. MARLEAH!!! Yay!! We are all very happy to have her here with us and we know she will do really great!! She is already doing a wonderful job .. keep it up Marleah!! Well I will let Marleah introduce herself to you guys I just know you will love her we do!! Yep, that’s what I’ve been doing this week. Working in the archive, organizing more files. It’s been weird not having Jillian around (I can’t imagine what it will be like when Amanda’s time is up in May), but we’re going to get another Katimavictim (I kid, I kid) on Monday. The group of them came by yesterday afternoon, completely exhausted and some of them interviewed to fill the shoes of Lauren, Laura, Yani, Zak and Jillian. (Those are some tough shoes, but I have confidence in them!) We’ll find out later this afternoon and then they’ll start on Monday. Woo hoo! We also had a researcher here from Monday to Thursday. Our new reading room is certainly getting a lot of use. I love it. Right now, it is also my working area. Oh, how I can’t wait to have these files finished! I feel like I really made some headway yesterday and I think/hope it will continue this way and be done soon. I head up to Nain the week after next. Oh, I’m so excited! If you’ve been following this blog for any length of time, you’ll know how much I love visiting Nain. Anyway, this has been a lovely break from working with the files, but I should get back to the files. I want to see how many I can get done before lunch. That’s 26 minutes from now! P.S. Jillian, we really miss you! Today is my last day working at Them Days. I know it’s clichéd, but I’ve got to say it feels just like yesterday when I first got off the plane and arrived in Goose Bay. Time has just flown by so quickly, it’s hard to realize that I am 1/3 of the way through the program! Aimee, Kelly and Amanda were the ones that really made this experience what it was. I could not have asked for better work partners. It’s been a pleasure working with all of them in the brief time we had together. I’ll really miss the negatives, the dirty white gloves, the paper, the 24 karat gold discs, FoC, the excessive use of post-its, archive pens, making boxes, getting frustrated with unorganized files, and flipping through defective magazines, to name a few. I’ve had so much fun working here, I really don’t want to leave. I’m sad to go, but also really excited to go somewhere new. I’ve had an incredible time in Goose Bay, and having Them Days be a part of it makes it that much better. Thanks for the jam-jams and the sugar cookies. I’ll miss you all so much! It’s so organized a-and…beautiful – I can’t even…it’s awesome. The caribou we saw on the road to Churchill Falls. Poor guy didn’t know what he was getting himself into. The sprinkles made me feel a bit better. If you keep up to date with the Twitter feed on the side of the page, you’ll have read my excitement over being able to check my e-mail again. We couldn’t use the Internet for one day last week (and debit/credit machines were down too!) Turns out it was caused by some heavy ice. Even now, there won’t be any blog readers from the North Coast until a tower is fixed! We’ve been having one strange ‘winter’ this year. (Why must it go above zero and melt all the snow?!) Thankfully today we’ve been having more snow and it’s been wintery again. Anyway, here are some photos from around the office. The first batch are from when we were doing the mailout back in December. We got it out before Christmas, but some subscribers have reported that they are still waiting. My own grandparents just got their copy in the mail last week and they are only at the other post office in town! Please be patient; apparently, it is taking our little magazine some time to get through the mail. If it’s still not in your mailbox in a couple of weeks, let us know. The second batch are more recent; they are of Amanda and Jillian organizing things back in the archive extension. Jillian’s been working on the periodicals and Amanda’s been working on the library, organizing supplies and putting things into safer storage containers. I’m still working on the vertical files…what the heck size of project did I take on?! I have to keep reminding myself of the end result…these files will be easier to find and to use. But boy, it is ever slow to get through! Jillian really loves labelling the periodicals! Amanda organizing supplies on the shelf. This is exciting because: the shelves aren’t full of things to be organized anymore and can be used for other things! Jillian with an awesome hat cupcake she made at the Katimavik house when I was there for a visit. After a long week of lugging stuff back and forth from the archive, I’ve managed to finish the periodical section! I think the most interesting periodical I’ve had to file were The Labradorian newspapers. You never knew when you might find a surprise between the pages. It was great seeing the old headlines and the issues that were going on at the time. What was really cool about it was that I’d see an issue and then go through a few years worth of news and then find the issue resolved. It’s always nice seeing things work out in the end. Speaking of the end, although I really enjoyed fixing up the periodicals, I am so glad it’s done!